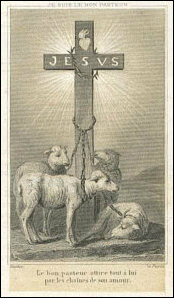 Image of 19th c. French Holy Card (Translation): "I am the Good Shepherd. The Good Shepherd attracts everything to Him through the chains of his love." died for us. -Rom. v. 8, 9.
and no man layeth it to heart (Isaias Ivii). courage would be so bold as to die for a good man. lay down his life for his friends (John xv. 13). for evildoers and the wicked, has never been seen. of the kind of people we are for whom He died. in Christ (Eph. ii. 4). man will believe when it shall be told (Habac. i. 5). that scarcely can our intelligence take hold of it.